We’re in Ciro Biondi’s truck, climbing a vertiginous rocky path in his Cisterna Fuori vineyard in the foothills of Mount Etna. It is not for the fainthearted or the easily carsick. Ciro says he’s taking it slowly because I’m in the truck, along with Mr. Sipswoosh. We both feel very grateful. Our destination is an open-sided kitchen and dining area, replete with comfy chairs and a view to die for – a panorama that sweeps over the Ionian sea to the Italian mainland. We are also armed with chilled bottles of Outis Etna Bianco and Rosso, the flagship wines and the ones you can most easily buy abroad. He didn’t always realise his luck, pursuing a career as an architect rather than taking on the family wine business that stretches back centuries. The Cisterna Fuori vineyard, and the nearby Chianta vineyard which we also visited, have been in the family since at least the 16th Century. Then Ciro met his English wife, Stephanie, and together they decided to revive Vini Biondi. More than a decade later, Vini Biondi is producing wines that are sought out by lovers of so-called authentic wines. This covers a broad category from producers following biodynamic principles to those making wines as naturally as possible, avoiding chemicals in the grape growing and winemaking process. The philosophy is that the wines are made in the vineyard, not through extensive manipulation in the winery, which – so the argument goes – gives the wines a greater sense of place. With Biondi though, this is less about capitalising on a niche-but-growing trend among wine drinkers and more about making wine the way Ciro’s forefathers did. For example, grapes are picked when the moon is waning because of a traditional belief that vines bleed at other times. Vines are pruned and trained albarello-style – like small trees – because that’s the way it’s been done for decades – even centuries. To eyes used to seeing vines trained along wires, this gives a very different look to a vineyard. They’ve also kept the old Vino Padronale sign outside their cantina, from the days when Biondi produced local wine for local people. They’re not totally old school though. 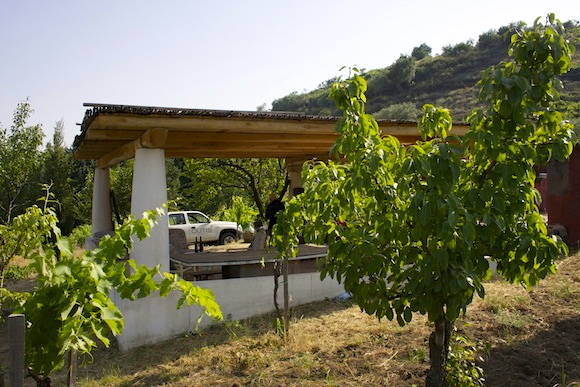 They no longer use the old winery, where Ciro remembers crushing grapes with his feet, choosing more modern, efficient – and more hygienic – methods. And they use winemaking consultant Cristiano Garella from Tenute Sella in Piedmont to guide them through each vintage. They are, however, still ageing wines in a cellar that, like the two vineyards we visited, has been in the Biondi family for around 500 years. 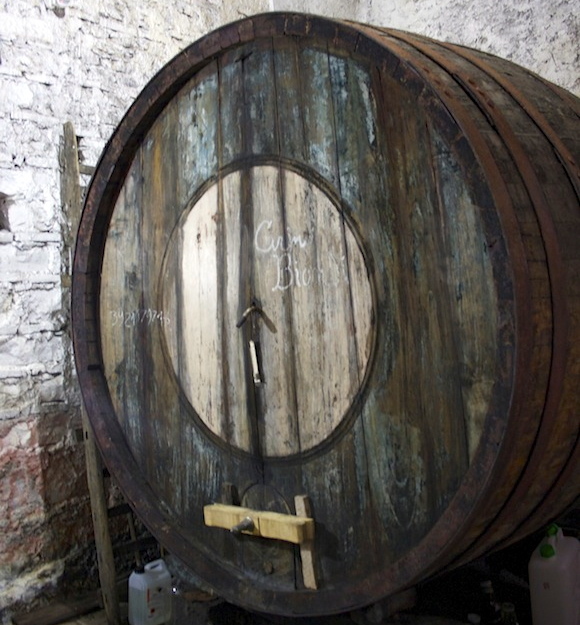 We started our visit in the cellar, where a large barrel bearing the signature of Ciro’s grandfather greets us. We taste a white straight from a barrel. It’s the soon-to-be-bottled Chianta 2011, named after the vineyard because it is made only from white grapes grown there, a blend of Carricante, Cataratto, Minella and Muscatella. It made me think of honeysuckle on dappled late summer afternoons, camomile tea, dried peaches and apricots, and a tiny back note of salted caramel. The Chianta is like the knowing older sister of the fruity, youthful, more commercially produced Etna whites that are so easy to knock back on a scorching day. We also tasted a voile-textured Cisterna Fuori 2010 (Nerello Mascalese and Nerello Cappuccio), also about to be bottled, packed with flavours of prune and earth but still with energy you’d expect from grapes grown at altitude (600-900 metres above sea level). As we chat, it is clear that Ciro and Stephanie still feel they are on a learning curve, eager to produce better wines each year. That doesn’t mean their current wines aren’t any good. On the contrary, the Etna reds I tried were soft, pure, fragrant and intense but not heavy. The Outis Etna Rosso 2008 we tried in the vineyard felt vibrant with its featherlight tannic grip and flavours of macerated strawberries in balsamic vinegar. We drank it lightly chilled. Yes, I’ll admit, I didn’t spit it all out. Too good. 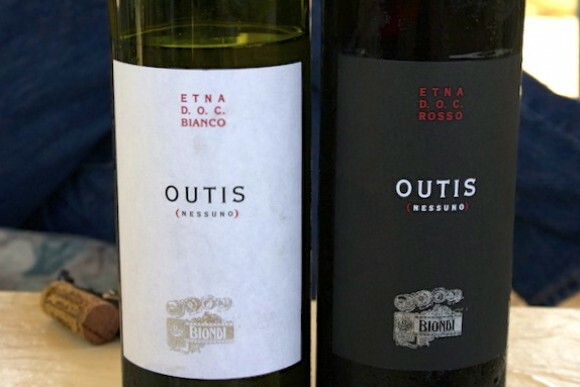 The Outis Etna Bianco 2010 felt clean, mineral and salty. As I sipped it, I imagined how well it would go with some local hard cheeses. Or the grilled tuna with salt I ate on my first night in Sicily. We said our goodbyes back at the cantina, in the punishing late afternoon heat. As we left, we too felt very lucky to have been given a glimpse of how Ciro and Stephanie Biondi are applying an old-world approach to producing wines that excite many 21st century palates. 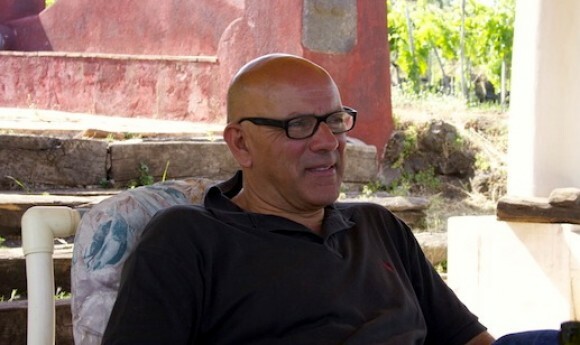 Vini Biondi featured in BBC TV’s “Sicily Unpacked”. You can read Stephanie’s account here. This post is a serious teaser for my upcoming trip to Etna in September. I’m going to head out and buy some of his wines in NYC this week in honor of this inspired post. Thanks…really well written, informative and a great story to hold onto. Beautifully written and a real pleasure to have met Paola. Look forward to Arnold’s visit ! Wonderful to read more about the history behind these wines. I tasted them in London back in March but did not chat nearly long enough to Ciro. 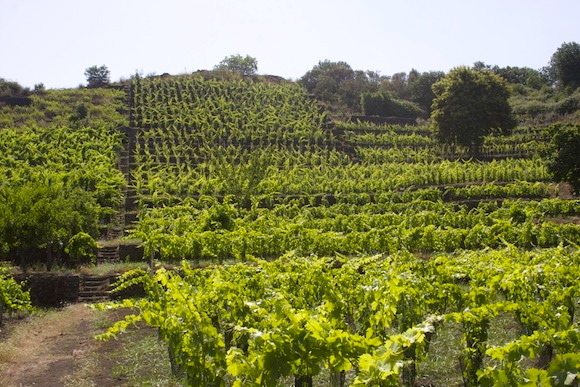 I absolutely love the photograph of the terraced vineyards. An interesting comparison with the alborella training also being used by Sandi Skerk in Friuli Carso – although admittedly on very different terrain.